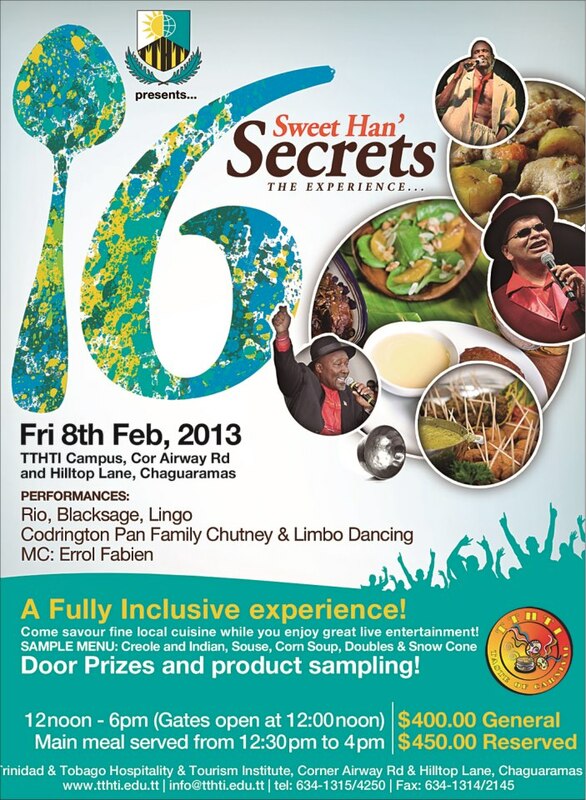 TTHTI’s annual Carnival season fete, TASTE OF CARNIVAL returns on Friday, February 8th themed as “Sweet Han’ Secrets, The Experience.” As always, this event will serve up some of Trinidad & Tobago’s tastiest local foods – Creole and Indian dishes, souse, corn soup, doubles, snow cone, and more. The 2013 TASTE OF CARNIVAL will feature live entertainers including Rio, Blacksage, Lingo, and Errol Fabien as MC, as well as Steel Pan, Limbo and Chutney. WHEN: 12pm – 6pm, Friday, February 8, 2013; Main Meal will be served from 12:30pm to 4pm. Gates open at 12pm. ADMISSION COST: $400 General; $450 Reserved. TASTE OF CARNIVAL tickets are only available at TTHTI .